Welcome to our very first Introduction to iPad Lettering Module! You will have ongoing access to this content for as long as you need it. It is always my intention to keep videos as short as possible, and to the point (nothing worse than hour long videos with lots of useless content), if you miss something, just go back and watch it again. If you have any questions about this week’s content, send me an email. In this module we’re going to cover the basics of Procreate, how to move your artwork around, and what all app settings do. 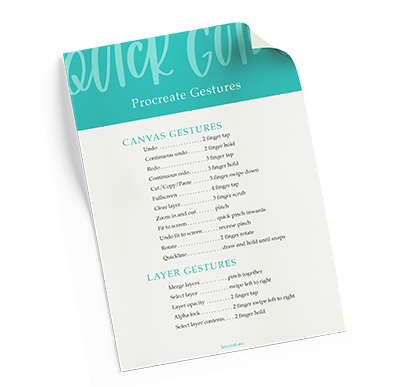 There’s also a video explaining the gestures that are available within Procreate to help you work faster and smoother and a printable ‘cheat sheet’ of all of those for you to save somewhere and refer back to as needed.